On any given Saturday, I often am out with my kids and they frequently get hungry. I don’t want to feed them junk food like McDonald’s, but I don’t want to spend a small fortune to feed them either. So what’s the compromise? Pizza! 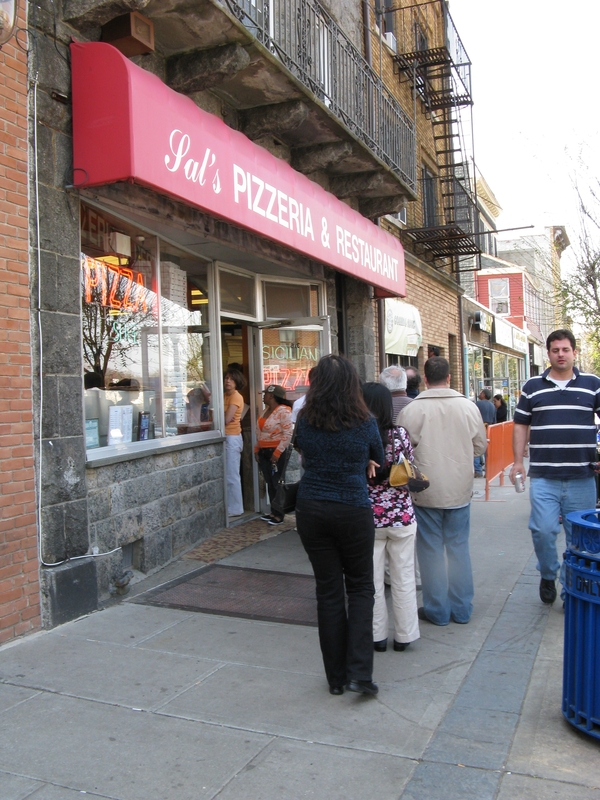 We are lucky to have lots of pizza places in Westchester, and one of the best is Sal’s in Mamaroneck. This place was first recommended to me by a friend who is Italian and grew up in Brooklyn. I figured he should know a good pizza when he tastes one. The last time we went was on a Saturday afternoon. As we walked up the street towards the restaurant, I could see the line of people coming out of the door. Was something wrong? Did the oven break down? Were they rationing the pizza? Nope. It was just a usual Saturday, and with pizza this good, there is often a line out the door. I knew that was a good sign, and was happy to join the line. Fortunately, it was not a long wait. We ordered a regular cheese pie, with one quarter pepperoni for my meating-eating teenage daughter. You can see that the pie was a vision of perfection. Not too much cheese, baked to bubbly brown colored perfection. Adequate amounts of sauce to support the cheese. Generous crust to hold it all together. Then comes the first test to see if it’s a good pizza: when you take a slice (we don’t eat “wedges” we eat “slices”) from the pie, is the crust crispy enough to hold the cheese? Or is it soft and flabby and melts under the weight of the cheese. This pie crust held up! The first sign of a good, crispy crust. Next comes a paper napkin to remove excess oil from the top of your pizza slice. You can dab it with a paper napkin, but I prefer to lay the napkin on top of the pizza, apply slight pressure to help it soak up the oil, then gently lift the napkin taking care to not rip it and leave some paper on top of your pizza. Next comes your condiments–for me, the pizza trifecta is garlic powder, red pepper, and parmesan cheese. Then you need to decide how to hold your pizza. I like to fold it in half lengthwise. This helps to keep the cheese from falling off. Others prefer to eat a slice unfolded. To each his own. The first bite will tell you if it’s a good pizza. The crust will have a good crunch, and may have a slightly smoky flavor. There won’t be too much cheese, and it will be tasty and not too salty. The sauce will play a supporting role, again not too salty but adding good flavor. If you have ordered additions like pepperoni, onions, mushrooms, or other meats and veggies, they too will play their role in providing you with a sublime pizza experience. I am pleased to say that Sal’s pizza provided the perfect pizza experience, just as I have described. While they have other great foods on th menu–I suspect the Minestrone soup is excellent because there were so many orders being eaten at other tables–their stand out specialty is their pizza. Thus, I would call this the best pizza place in Westchester. If there are others that you think are just as good or better, then let me know. I will be happy to go and check them out and report back here. 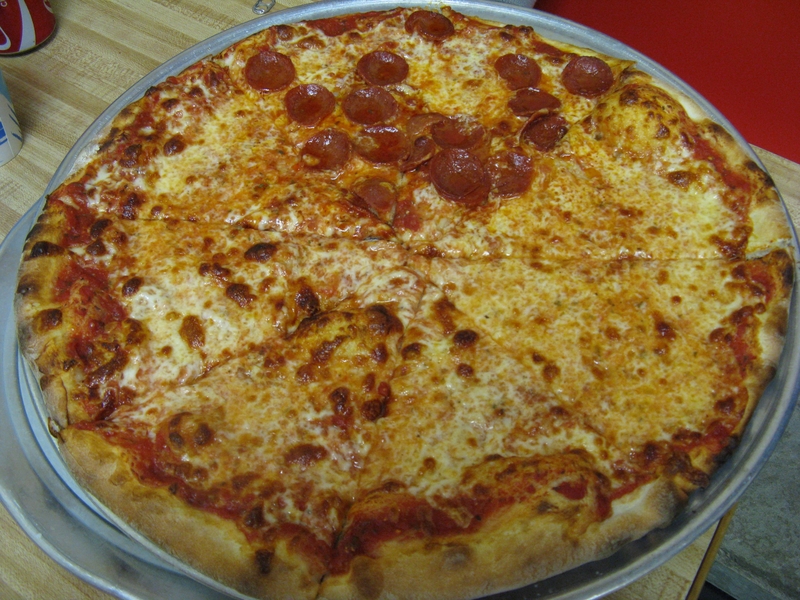 Until that time, Sal’s has the best local pizza in my opinion. The warm weather is FINALLY returning, and I am headed back outside with my kids! One of the good things about living in Westchester is there is a lot of outdoor public space available for exploring, playing, and learning. 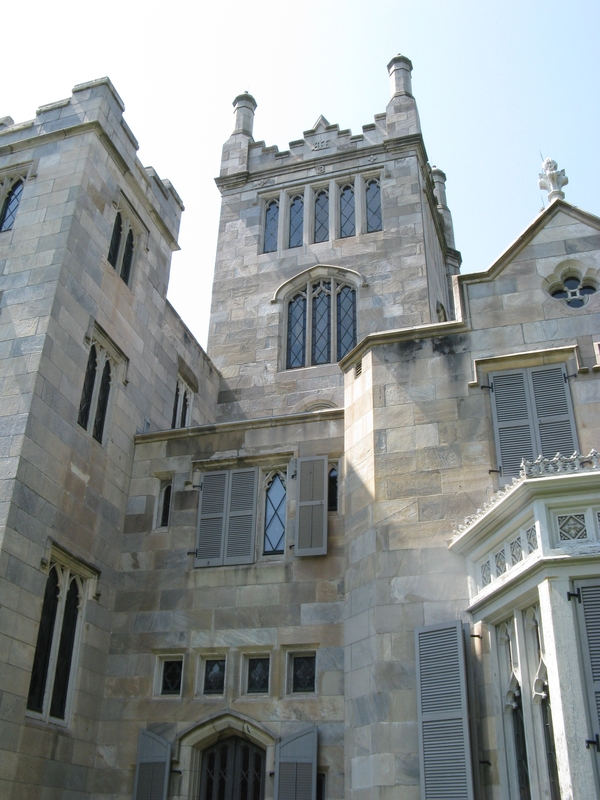 One such place is Lyndhurst, which is a beautiful Gothic Style mansion with surrounding grounds that overlook the Hudson River. 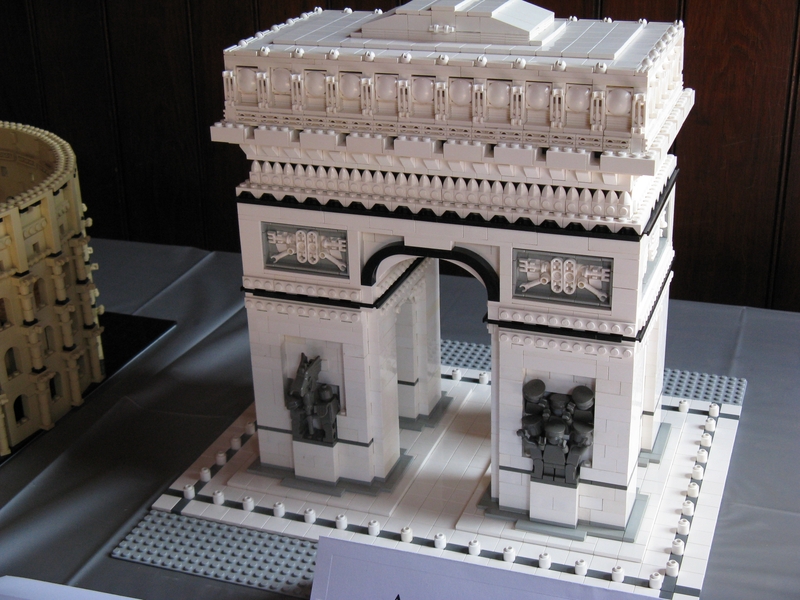 They have events open to the public throughout the year, and this weekend held a LEGO festival. Admission cost $7 per adult, while kids were free. LEGO activities included seeing LEGO Robotics League submissions from NYC school children. After talking with a couple of the teachers who were there with their teams, I learned that there are no teams from Westchester schools, and there are few girls who get involved. My husband is an engineer, so I came home and immediately launched into why he should start a LEGO League Team in our town’s school and reach out to girls to participate. He just nodded and smiled, as he often does when I come home really jazzed about something. Other activities included seeing the work of master LEGO builder Arthur Gugick, who told me he is a math teacher by day, and LEGO Builder by night. I asked him how he created his designs, and he told me he designs everything on paper and devotes lots of time to mapping out his designs before he begins. I also learned he gets his parts through a huge Ebay trade on LEGOs pieces, and there are 4,000 different LEGOs pieces he uses for his creations. Other activities included open tables with loads of LEGOs pieces for the kids to build and create, a treasure hunt through the property, and a tour of the Mansion. While there was food available for purchase (bring cash, no debit cards accepted), the weather and the grounds were so beautiful, it would have been a perfect venue for a picnic. Overall, it was a fun and inexpensive outing, with lots of running around, which was great for inducing a good afternoon nap in my four year old. I love chocolate. There is simply no other way to put it. Not just the kind of chocolate you can buy in a candy store, but the rich dark chocolate that has flavor nuances like good wines. Chocolate that is rich and fulfilling so all you need is a small amount to be satisfied. Chocolate that is diluted with very little milk, and not too much sugar, but is as pure as possible. I am the type who makes an annual pilgrimage to the New York Chocolate Show. I simply love chocolate. So when I recently saw a video on the NYTimes webpage about the Best Hot Chocolate in New York, I knew immediately that I would have to try all of these places. Being such an avid (or perhaps rabid) chocolate fan, I was already familiar with the Jacques Torres chocolate shop mentioned in the video. It is one of my “must go to” places when I visit friends in Brooklyn. His hot chocolate is certainly one of the best. It is rich and complex, thick and satisfying. 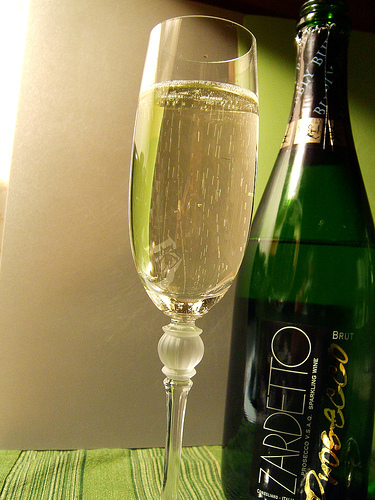 Plus he offers two versions: a regular and one that is spicy and pays homage to the Mexican roots of this drink. The biggest plus to his chocolate, is you can buy a can of the mixture (but be prepared for sticker shock) to make your own hot chocolate at home. 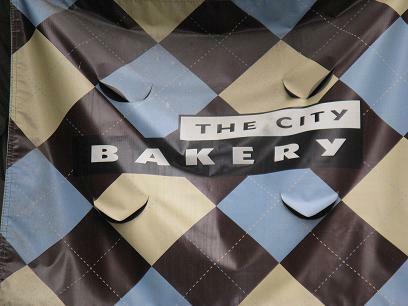 Wanting to try something new, I decided to go The City Bakery on 18th street to taste their version. Bottom line: it’s great! Their hot chocolate is definitely made from a mixture of chocolate that is melted down and diluted with milk to form a thick and satisfying drink. It is very, very rich and heavy, but in a good “chocolate satisfaction” way. They have been able to strike the right balance of intense chocolate flavor, without too much sugar which can make it too cloying, or too much milk which can dilute the flavor. Interestingly, the chocolate was not too hot, so it’s savoring the flavor that makes you sip it, rather than the heat. The picture above is a cup of our hot chocolate after my four year old got to it (she dove right in before I was able to get a picture). They also have huge marshmallows available, that are nice but not necessary for a good hot chocolate treat. Since they serve the hot chocolate at a cooler temperature, the marshmallow did not melt quickly. 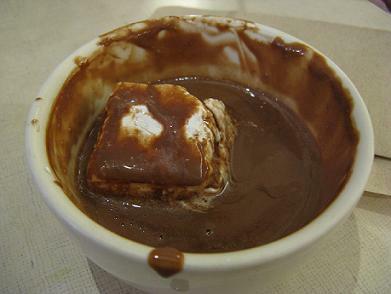 However, the chocolate has enough heat to make the surface of the marshmallow soft and easy to scrape off with a spoon. If you like a strong marshmallow flavor, then it’s worth it. My four year old was not interested, and wanted to focus all her energies on the hot chocolate itself. In addition to their signature drink, the City Bakery is a real bakery and offers lots of pastries, cookies, foods and other treats available to satisfy your hunger (my 14 year old loved the mac and cheese). The biggest problem was that seats were hard to find in this place. Some people clearly were there to spend a few hours reading a paper, or working on their laptops. However, I was a mom with two kids in tow and finding a table was difficult. Since we went on a Saturday afternoon, I am not surprised the place was filled, and seating may be better at other times. Also, this place is definitely not a bargain. The prices are high, but if you limit yourself to the hot chocolate and a pastry, you can visit without breaking the bank. If you want to eat (especially with a couple of kids) then I would recommend going to Republic instead, which is an inexpensive noodle place a couple of blocks away. So overall, this was definitely worth a trip into Manhattan (I live 30 minutes outside of the city), and I will go back to check out the other hot chocolate spots in the city. My teenage daughter really surprised me this weekend when she got a call from some friends who invited her to go to the movies. They wanted to go see Macbeth. In addition, it wasn’t just any production of Macbeth, but was an opera…..and a bunch of teenagers were actually going to see it. It turns out that the New York Metropolitan Opera is hosting a series of high-definition transmissions of several performances to movie theaters across the country. This week’s performance was Macbeth, which my daughter’s English class is currently reading. Her teacher assigned attendance to this performance as an extra credit activity for her class, and a number of the kids decided to attend. 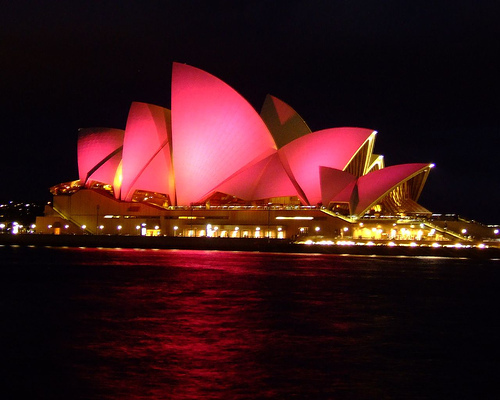 I am not really into opera, but I think this is a great idea and an easy way to get to see high quality opera, at a very reasonable price. The series is being broadcast to over 300 theaters across the US (see full list here). In Westchester County, the series is being broadcast at two convenient locations: New Roc Cinema in New Rochelle, and City Center in White Plains. Lastly, the tickets are very reasonably priced at $15 for kids, and $22 for adults. Usually she is not allowed to go out with her friends until she has finished her chores, but how could I say no to Macbeth and the Metropolitan Opera? When she got home, I asked her what she thought. She shrugged and said “It was OK”. She also said it was “weird” because when she and her friends walked into the theater, it was (as she puts it) “a sea of old people, and us”. I think the organizers from the Met would be thrilled to hear that a bunch of young people attended the event. While I am not really into opera, this series is so convenient and affordable that it’s worth trying out, and I may go later this year with my other children. Anyone interested in La Boheme? Today is the last day of the year, and I remain committed to making things easy and simple in the upcoming year. Since it is New Year’s Eve, the Westchester town of New Rochelle is hosting a First Night celebration with lots of activities and things to do with kids. I was thinking about going to the children’s library for their “crazy hat making” event with my four year old, but stayed close to home and had one of her friends come over for a play date instead. After dress up and pretend cooking, they ended up having tea in the kitchen while the other mother and I killed the “supernatural brownies” I made yesterday from a recipe I read in the NY Times. After they left, I cooked up a pot of black eyed peas for hoppin’ john, which we ate for dinner. My husband wants to make sure we have enough left over to eat tomorrow on New Year’s Day for good luck this year. Now that the night has settled in, I am relaxing on the couch watching the Twilight Zone marathon (another New Year’s tradition in my home). My teenagers are gone—both were invited to parties with their friends. As a result, the house is really quiet. My husband and I are sharing a bottle of Prosecco, while my four year old is thrilled to be allowed to stay up late and play with her crayons. So no night out, no running around, and no drama. It would be nice to have more nights like this in the upcoming year. Now I am going to watch one of my favorite TZ episodes, Time Enough at Last. Musings on how a disorganized woman with a full time job, three kids and a real need to relax is trying to make life simple.